City careers still keep characters played by Bill "Bojangles" Robinson and Shirley Temple on the farm in the 1938 film version of "Rebecca of Sunnybrook Farm." Being an evicted orphan who flubs an audition cannot be fun. Getting along with countryfolk means a fresh start. 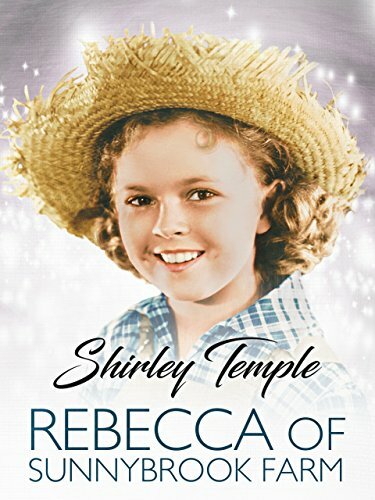 Will a talented tyke’s heart have room for big city businessmen, unpretentious upstate farmers or both in “Rebecca of Sunnybrook Farm”? • "Just Around the Corner" in 1938. Shirley Temple at the White House, June 24, 1938, two months after the release of "Rebecca of Sunnybrook Farm"
"Shirley told the President about losing a tooth last night, and he told her about Sistie and Buzzie losing their teeth"
City careers and country living are not mutually exclusive in Rebecca of Sunnybrook Farm by writers Don Ettlinger and Karl Tunberg; producers Raymond Griffith and Darryl F. Zanuck; and director Allan Dwan. Arthur C. Miller; Allen McNeil; and Mark Gordon, Sidney D. Mitchell, Samuel Pokrass, Lew Pollack, Harry Revel, Raymond Scott, and Jack Yellen handle cinematography, editing, and music. Filming showcases California’s Movietone City and Santa Catalina Island. The 80-minute musical adapts Kate Douglas Wiggin’s (1856-1923) 1903-published, same-named children’s classic. Its distributor was 20th Century-Fox. Its USA-release date was March 18, 1938. The movie begins with “Crackly Grain Flakes” manufacturer Cyrus Bartlett (Paul Harvey) bemoaning flopped nationwide advertisements. He blames radio advertising executive Anthony Kent (Randolph Scott). Eight-year-old Rebecca Winstead’s (Shirley Temple) “Little Miss America” audition impresses Cyrus. Tony informs announcer/singer Orville Smithers (Jack Haley) to stop auditioning. Orville misunderstands. Evicted from their lodgings, Rebecca and manager/stepfather Henry Kipper (William Demarest) travel upstate to Sunnybrook Farm whose owner is Miranda Wilkins (Helen Westley), Rebecca’s maternal aunt. Tony just misses Harry and Rebecca. Orville purports paper trails on all auditionees. Tony takes time off on his farm upstate. Rebecca chases Miranda’s piglet to the neighboring farm managed by Homer Busby (Slim Summerville) and owned by Tony. Tony corners the piglet after falling into a well. Rebecca and cousin Gwen Warren (Gloria Stuart) impress Tony. But Miranda relives the humiliation of Homer drinking the night before their marriage and leaving her at the altar 25 years ago. Rebecca sneak-visits her neighbors. Orville arrives in time for Cyrus’ call. Cyrus, Orville, and Tony recognize Rebecca’s singing voice. Miranda refuses to let Rebecca go to NYC. Miranda blames the entertainment industry for her sister’s misery and premature death. Rebecca escapes through the window. The ladder falls before Homer leaves. Miranda finds Homer hiding in Rebecca’s bedroom. Homer gets second chances with Miranda. Tony to pay Harry $5,000 for Miranda’s custody of Rebecca. The movie ends with Miranda’s farmhand Aloysius (Bill Robinson) and Rebecca’s “Little Miss America” dancing and singing to Raymond Scott Quintet’s “Toy Trumpet” for audiences including Cyrus, Gwen with Tony, Homer with Miranda, and Lola with Orville. 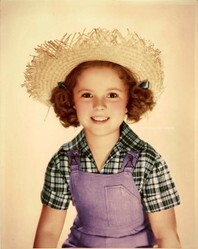 Shirley Temple in overalls and straw hat for "Rebecca of Sunnybrook Farm"
"Shirley Temple photo circa 1938, colorized"
Characters played by Cesar Romero and Shirley Temple bring peace to the Khyber Pass in the 1937 film version of "Wee Willie Winkie."